On a Tuesday in March, a Dodge Sprinter Van painted with puffy white clouds, deep blue waters, and green hills speckled with farmhouses pulls up in front of the Bridge Street Butchery in Waitsfield. The Grateful Dead pulses on the radio. The driver, Ethan Wood, owner of Wood Mountain Fish, has just driven 200 miles through a blizzard from the Boston fish pier to this little town in the Green Mountains of Vermont to make his delivery. In the back of his van, below his skis mounted on the inside, he pulls out a cooler. Nestled on ice, he has sushi-grade tuna, scallops so fresh they’re still twitching, and oysters from Martha’s Vineyard. “The least I can do is drive through a foot of snow,” said Wood, “the chefs in the Valley are amazing.” He hustles into the Butchery, a beautifully restored 1845 building, jokes with the owner Jeff Lynn, and scrambles back to his van. He has one more delivery to make and then he can hit the slopes at nearby Mad River Glen. 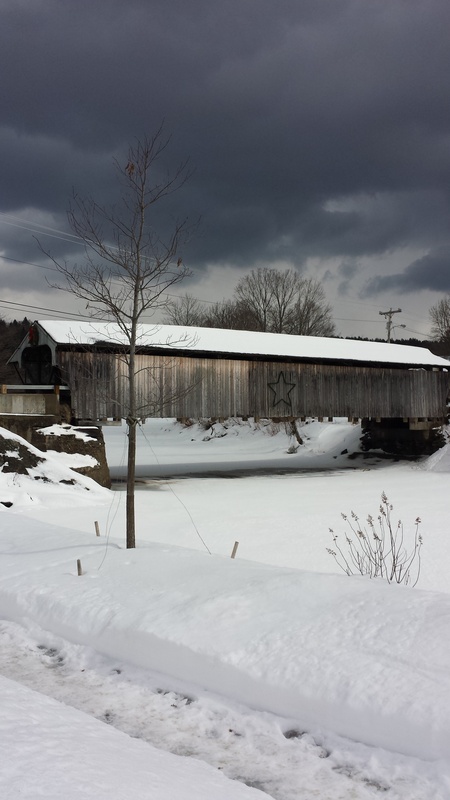 At first glance, the Mad River Valley might seem like just another quintessential Vermont landscape—quaint with its covered bridge and historic downtown, dramatic with its meandering river and steep mountains, picturesque with its Belted Galloway cows and round barn. It is all of these things. But there’s also something magnetic that makes people, like Wood, trek through blizzards to get to this place. It’s partly the amazing outdoors. Skiers flock to Mad River Glen famous for its single chair and slogan, “Ski It If You Can” and nearby Sugarbush ski resort. There’s also an abundance of cross-country touring and snowshoeing. Or if sledding is your thing, you can hike with a Mad River Rocket Sled on your back, turtle-style, a mile up an unplowed mountain road, enjoy hot chocolate at the top, and cruise the longest run of your life. The summer time is just as fun with biking, hiking, and kayaking. Beyond the Valley’s outdoor draw, though, is a serious food culture making it a culinary destination, too. There’s something tasty for everyone whether you’ve driven here for a day of skiing and a good meal or settling in for a week and cooking at home. Take Mad Taco. After a morning skiing, before our Sunday drives home, my family—husband and two kids, ages 11 and 13—and I hunger for a tasty burrito. Tucked away in a strip mall, next to Mehuron’s Supermarket, is the tastiest Mexican fare I have had on the east coast. Think gourmet Chipotle. Mad Taco uses only local Vermont ingredients—with the exception of avocados and other fair weather crops—for their small but inspired menu. The smoked pork belly, jalapeno, cilantro taco is a must. As is the roasted yam burrito with rice and beans, sliced avocado, pico sauce and cilantro. It’s simple but filling and flavorful. And make sure to try all of the five or six hot sauces they’re showcasing (out of over 100 they’ve created). The sauces are spicy so beware of their heat meter–each one is assigned a number with 1 the mildest and progressing to 10 the hottest. The latter might require medical assistance. The highest I have ever gotten was a six. Mad Taco is a dive but that’s part of its charm. With so many meat and produce farms in the area, the Mad River Valley has always been a place for fresh, local ingredients. Farms like Gaylord, Neill, and Jasper Hill supply the restaurants with their cheese, beef, pork, and corn on the cob, making the quality of ingredients top-notch. The Mad River Valley also has a reputation of being a birthing ground for artisan food. Green Mountain Coffee started here as a little café in 1981. As did American Flatbread pizza in the early 1990s, spawning frozen pizzas and out-of-state franchises. Dinner at American Flatbread is an iconic Valley experience. Housed in Lareau Farm and only open Friday and Saturday nights, you must sign up early for this popular spot. Lining up at 3:30 pm is recommended, so you’ll have to leave the slopes before they close. It’s worth it. As you sip local Lawson’s beer and wait for your Evolution Salad of sweet leaf and mesclun lettuces tossed in a ginger-tamari vinaigrette and sprinkled with Jasper Hill blue cheese, you can watch your pizza cook in their giant wood-fired clay oven. My favorites are the Punctuated Equilibrium with olives, oven-roasted sweet red peppers, and Vermont artisanal goat cheese; and the New Vermont Sausage with local pork in a homemade maple-fennel sauce baked with sundried tomatoes, caramelized onions and roasted mushrooms. Save room for the apple pie also made in the clay oven. The owner George Shenck doesn’t just make the dough; he’s also a philosopher. If you’re lucky enough to meet him ask him about his declarations on the website. Another not-to-be-missed dinner after a day of fresh air and exercise is at Peasant restaurant on Bridge Street. The owner Chris Alberti traded equities on Wall Street for years and escaped the Twin Towers on 9/11. A few years ago he and his wife, Mary Ellen, and their five children moved from New York and started the East Warren Vineyard. They took over the space that had previously been The Green Cup—A New York Times reviewed restaurant–after its restoration from the destruction of Hurricane Irene. A few feet from the covered bridge and Mad River, the small Peasant has a majestic setting. The food, rustic in feel and leaning toward Tuscan, is simple but with depth. The Tagliatelle with Mushroom Gorgonzola Cream Sauce and the Cassoulet of White Beans, Chicken, Sausage and Pork transports you to a country kitchen in Italy or France. But the Brussels Sprout Salad with Apple, Lardons and Asiago roots you firmly in Vermont. The candlelit rooms, comfortable tables, and bar feel as if you are eating in the Alberti’s home. Considering that many members of the family work there, I guess you are. Around the corner from Peasant, and the source of their desserts, is The Sweet Spot, home of Scout’s Honor Ice Cream and Sweet Simone’s Bakery including homemade bagels and the best cupcake I have had–gluten-free chocolate with dulce de leche frosting—light and full of flavor. This gem of a bakery has just expanded and now has a few seats. Otherwise, if the weather’s nice you can get an Espresso to go. Perfect for energizing you for a grueling bike ride over the nearby Schuss Pass Road. The Sweet Spot is owned by siblings Lisa Curtis and John Vitko. He makes the ice cream and she the pastries. At the Bridge Street Butchery, next door, owner Jeff Lynn is busy making one of his sandwiches named after famous bridges of the world—The Brooklyn Bridge is Reuben-like, or my favorite, Storseisundet Bridge, is made with smoked salmon. If it’s the summer, get it to go. Walk two blocks north on Route 100 to Clearwater Sports. Rent a kayak for the afternoon and have a picnic on the banks of the Mad River. As you’re floating back downstream, dream of what you want for dinner. You have so many wonderful options right near by. Yummmm!!!! I am hungry now.